Mentha (also known as mint, from Greek míntha, Linear B mi-ta) is a genus of plants in the family Lamiaceae (mint family). It is estimated that 13 to 18 species exist, and the exact distinction between species is still unclear. Hybridization between some of the species occurs naturally. Many other hybrids, as well as numerous cultivars, are known. The genus has a subcosmopolitan distribution across Europe, Africa, Asia, Australia, and North America. Mints are aromatic, almost exclusively perennial herbs. They have wide-spreading underground and overground stolons and erect, square, branched stems. The leaves are arranged in opposite pairs, from oblong to lanceolate, often downy, and with a serrated margin. Leaf colors range from dark green and gray-green to purple, blue, and sometimes pale yellow. The flowers are white to purple and produced in false whorls called verticillasters. The corolla is two-lipped with four subequal lobes, the upper lobe usually the largest. The fruit is a nutlet, containing one to four seeds. While the species that makes up the genus Mentha is widely distributed and can be found in many environments, most grow best in wet environments and moist soils. Mints will grow 10–120 cm tall and can spread over an indeterminate area. Due to their tendency to spread unchecked, some mints are considered invasive. The list below includes all of the taxa recognized as species in recent works on Mentha. No author has recognized all of them. As with all biological classifications of plants, this list can go out of date at a moment’s notice. Common names are also given for species that have them. Synonyms, along with cultivars and varieties, are given in articles on the species. Mentha is a member of the tribe Mentheae in the subfamily Nepetoideae. The tribe contains about 65 genera, and relationships within it remain obscure. Authors have disagreed on the circumscription of Mentha. Some authors have excluded M. cervina from the genus. M. cunninghamii has also been excluded by some authors, even in some recent treatments of the genus. In 2004, a molecular phylogenetic study indicated both of these species should be included in Mentha. The mint genus has a large grouping of recognized hybrids. Synonyms, along with cultivars and varieties where available, are included within the specific species. Mentha x gracilis and M. rotundifolia: The steel ring is to control the spread of the plant. All mints thrive near pools of water, lakes, rivers, and cool moist spots in partial shade. In general, mints tolerate a wide range of conditions, and can also be grown in full sun. Mint grows all year round. Some mints can be propagated by seed, but growth from seed can be an unreliable method for raising mint for two reasons: mint seeds are highly variable — one might not end up with what one supposed was planted — and some mint varieties are sterile. It is more effective to take and plant cuttings from the runners of healthy mints. The most common and popular mints for commercial cultivation are peppermint (Mentha × piperita), native spearmint (Mentha spicata), Scotch spearmint (Mentha x gracilis), and cornmint (Mentha arvensis); also (more recently) apple mint (Mentha suaveolens). Mints are supposed to make good companion plants, repelling pesty insects and attracting beneficial ones. They are susceptible to whitefly and aphids. Mint is a necessary ingredient in Touareg tea, a popular tea in northern African and Arab countries. Tea in Arab countries is popularly drunk this way. Alcoholic drinks sometimes feature mint for flavor or garnish, such as the mint julep and the mojito. Crème de menthe is a mint-flavored liqueur used in drinks such as the grasshopper. 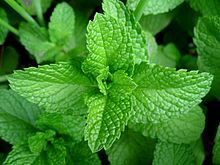 Mint essential oil and menthol are extensively used as flavorings in breath fresheners, drinks, antiseptic mouth rinses, toothpaste, chewing gum, desserts, and candies, such as mint (candy) and mint chocolate. The substances that give the mints their characteristic aromas and flavors are menthol (the main aroma of peppermint and Japanese peppermint) and pulegone (in pennyroyal and Corsican mint). The compound primarily responsible for the aroma and flavor of spearmint is L–carvone. Mints are used as food plants by the larvae of some Lepidoptera species, including buff ermine moths. Mint was originally used as a medicinal herb to treat stomach ache and chest pains. There are several uses in traditional medicine and preliminary research for possible use in treating irritable bowel syndrome. Menthol from mint essential oil (40–90%) is an ingredient of many cosmetics and some perfumes. Menthol and mint essential oil are also used in aromatherapy which may have clinical use to alleviate post-surgery nausea. Mint oil is also used as an environmentally friendly insecticide for its ability to kill some common pests such as wasps, hornets, ants, and cockroaches. Known in Greek mythology as the herb of hospitality, one of mint’s first known uses in Europe was as a room deodorizer. The herb was strewn across floors to cover the smell of the hard-packed soil. Stepping on the mint helped to spread its scent through the room. Today, it is more commonly used for aromatherapy through the use of essential oils. Mint descends from the Latin word mentha, which is rooted in the Greek word minthe, personified in Greek mythology as Minthe, a nymph who was transformed into a mint plant, and reflex of a proto-Indo-European root whence also Sanskrit -mantha, mathana (premna serratifolia). Mint leaves, without a qualifier like ‘peppermint’ or ‘apple mint’, generally refers to spearmint leaves. In Spain and Central and South America, mint is known as menta. In Lusophone countries, especially in Portugal, mint species are popularly known as hortelã. In many Indo-Aryan languages, it is called pudīna, (Sindhi: ڦُودنو‎), Hindi: पुदीना , (Bengali: পুদিনা). The taxonomic family Lamiaceae is known as the mint family. It includes many other aromatic herbs, including most of the more common cooking herbs, such as basil, rosemary, sage, oregano, and catnip. As an English colloquial term, any small mint-flavored confectionery item can be called a mint. In common usage, other plants with fragrant leaves may be called “mint”, although they are not in the mint family. Vietnamese mint, commonly used in Southeast Asian cuisine is Persicaria odorata in the family Polygonaceae, collectively known as smartweeds or pinkweeds. Mexican mint marigold is Tagetes lucida in the sunflower family (Asteraceae). †Mentha pliocenica fossil seeds have been excavated in Pliocene deposits of Dvorets on the right bank of the Dnieper river between the cities of Rechitsa and Loyew, in south-eastern Belarus. The fossil seeds are similar to the seeds of Mentha aquatica and Mentha arvensis. ^ a b Harley, Raymond M.; Atkins, Sandy; Budantsev, Andrey L.; Cantino, Philip D.; et al. (2004). “Labiatae”. In Kubitzki, Klaus; Kadereit, Joachim W. The Families and Genera of Vascular Plants. VII. Berlin; Heidelberg, Germany: Springer-Verlag. pp. 167–275. ISBN 978-3-540-40593-1. ^ a b Bunsawat, Jiranan; Elliott, Natalina E.; Hertweck, Kate L.; Sproles, Elizabeth; Alice, Lawrence A. (2004). “Phylogenetics of Mentha (Lamiaceae): Evidence from Chloroplast DNA Sequences”. Systematic Botany. 29 (4): 959–64. doi:10.1600/0363644042450973. JSTOR 25064024. ^ a b Brickell, Christopher; Zuk, Judith D. (1997). The American Horticultural Society: A-Z Encyclopedia of Garden Plants. New York, NY: DK Publishing. p. 668. ISBN 0-7894-1943-2. ^ Aflatuni, Abbas; J. Uusitalo; S. Ek; A. Hohtola (January–February 2005). “Variation in the Amount of Yield and in the Extract Composition Between Conventionally Produced and Micropropagated Peppermint and Spearmint”. Journal of Essential Oil Research. 17 (1): 66–70. doi:10.1080/10412905.2005.9698833. ISSN 1041-2905. Archived from the original on 2007-06-17. Retrieved 2005-05-10. ^ Rose, Francis (1981). The Wild Flower Key. Frederick Warne & Co. p. 310. ISBN 0-7232-2419-6. ^ Brickell, Christopher; Cole, Trevor (2002). The American Horticultural Society: Encyclopedia of Plants & Flowers. New York, NY: DK Publishing. p. 605. ISBN 0-7894-8993-7. ^ Quattrocchi, Umberto (1999). CRC world dictionary of plant names : common names, scientific names, eponyms, synonyms, and etymology. Boca Raton, Florida: CRC Press. p. 1659. ISBN 0849326737. ^ “Mentha cordifolia“. Germplasm Resources Information Network (GRIN). Agricultural Research Service (ARS), United States Department of Agriculture (USDA). Retrieved 11 December 2017. ^ “Mentha spicata, spearmint”. RHS Gardening. Royal Horticultural Society. ^ a b c Bradley, Fern (1992). Rodale’s All-new Encyclopedia of Organic Gardening. Emmaus, Pennsylvania: Rodale Press. p. 390. ISBN 0-87857-999-0. ^ “Mint, Economic Importance”. The Canadian Encyclopedia. Retrieved 31 December 2015. ^ Ortiz, Elisabeth (1992). The Encyclopedia of Herbs, Spices & Flavorings. London: Dorling Kindersley. pp. 36–7. ISBN 1-56458-065-2. ^ a b c d “Peppermint oil”. National Center for Complementary and Alternative Medicine, US National Institutes of Health. 2014. Retrieved 11 October 2014. ^ Jamila, F.; Mostafa, E. (2014). “Ethnobotanical survey of medicinal plants used by people in Oriental Morocco to manage various ailments”. Journal of Ethnopharmacology. 154 (1): 76–87. doi:10.1016/j.jep.2014.03.016. PMID 24685583. ^ Hunt, R.; Dienemann, J.; Norton, H. J.; Hartley, W.; Hudgens, A.; Stern, T.; Divine, G. (2013). “Aromatherapy as Treatment for Postoperative Nausea”. Anesthesia & Analgesia. 117 (3): 597. doi:10.1213/ANE.0b013e31824a0b1c. ^ Bayat, R.; Borici-Mazi, R. (2014). “A case of anaphylaxis to peppermint”. Allergy, Asthma & Clinical Immunology. 10: 6. doi:10.1186/1710-1492-10-6. ^ Bounds, Gwendolyn “Death by Mint Oil: Natural Pesticides”, The Wall Street Journal, July 30, 2009, accessed December 6, 2010. ^ “Mint”. Herbsociety-stu.org. Archived from the original on 2013-06-29. Retrieved 2013-07-14. ^ Sharon J. Huntington. “A not-so-boring history of flooring”. CSMonitor.com. Retrieved 2013-07-14. ^ Davidson, Alan (1999). The Oxford Companion to Food. Oxford: Oxford University Press. p. 508. ISBN 0-19-211579-0.